Is this the roofless variant of Chiron? Bugatti has unveiled the latest hypercar Chiron some time ago. 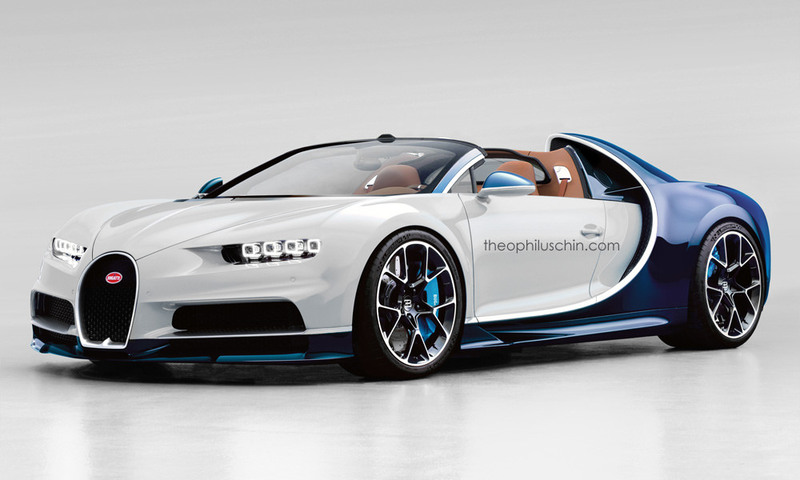 It’s time to see how the future Grand Sport open-top version of the Bugatti Chiron could look like thanks to a new rendering by Theophilus Chin. As quoted of Worldcarfans, Bugatti has received a lot of orders and current limiting the Chiron production no more than 500 units. The delivery of the first phase will begin next October with the number of 350 units. Reflecting on the previous Veyron, we assumed that Bugatti also prepared a Grand Sport variant with the open roof model. Especially for this special models, Bugatti preparing a separate quota as much as 65 units per year. Seeing the fact then the signal leads to the Chiron will get a version of the Grand Sport. And this targa version will be launched in 2018. That's what Theophilus Chin is trying to preview in his newest rendering attached here. He calls his project the "world’s meanest, craziest, and faster hair dryer," which makes us wondering how fast the Chiron Grand Sport could actually be. Just as a reminder, its predecessor was able to reach 224 miles per hour (360 kilometers per hour) with the roof down and 253 mph (407 km/h) with the roof up, so we expect these numbers to be slightly increased for the Chiron.